The occupational Islamic Republic's introduction of oil rationing for one of the world's largest oil-producing states, which noteworthy due to its incompetency does not have refining capabilities to meet demand in turn having to import gasoline, has caused deadly civil unrest across the nation leaving at least three people dead. The Islamist tyrants sent their security forces to quell the unrest which resulted in further intensification of acts of rebellion with the torching of tens of gas stations & destruction of banks by masses of enraged people. Thousands across Iran chanted slogans against the Islamist dictatorship. Iranian pop star Mahasti, the younger sister of another profilic singer Hayedeh passed away yesterday after battling cancer for four years. She was a very acclaimed and loved Iranian singer. Both sisters were monarchists and staunch opponents of the Islamic Republic occupying Iran - they suffered greatly living away from their motherland and their songs centered around the pain of living in exile. Thanks to Arvin for having posted this beautiful video. A longer version of the above clip can be found HERE. I do not support any factions of the terrorist Mojahedin organization (MKO, NCROI + all of its umbrella/lobby organizations...). However I'd like to highlight these video-clips which show how the savage intelligence agents of the terrorist Islamic Republic occupying Iran are free to operate in European countries and how they even utilize the same barbaric tactics (knife wielding) used on innocent Iranians inside Iran. France has been a country where these terrorists have been allowed to operate freely ever since the French governments shameful coverup (in the early 1990's) after the killing of PM Shahpour Bakhtiar by hit squads sent by the Islamic Republic. I do believe that not all members of the Mojahedin are fully aware of that organization's history and/or current activities and I also believe that certain members might have joined that organization out of desperation because they have seen it as the only ARMED organization which is combating the Islamic Republic occupying Iran. The World Bank promotes and conducts business with the terrorist Islamic Republic occupying Iran despite sanctions levered by the UN Security Council. Historical revisionists pertaining to Iranian affaires are on the rise. The revisionists are targetting the Iranian identity, culture, and history. This is not limited to just revisionist history in regards to the Pahlavi Dynasty which have been exposed to some extent previously on this site but goes also back thousands of years back to the times of Cyrus the Great and the Persian Empire before the forceful imposition of Islam. Today I received a very disturbing report by acclaimed Iranian historian Dr Kaveh Farrokh which dealt with this topic. Re-writing history to produce a false outcome that fits ones political and social agenda is a great threat which the Iranian Nation is having to deal with in light of Islamists trying to eradicate any pre-Islamic links of the Iranian people - notably this campaign is not only one that is taking place in textual form but also through actions such as the current dam construction in Iran by the occupational Islamic Republic which has destroyed countless numbers of historical Iranian cultural heritage sites - with the most recent example that comes to my mind being the opening of the Sivand Dam which lies in close proximity to Pasargard and somewhat further from the ancient capital of the Empire - Persepolis; both sites are said to be at possible risk of harm by the dam. I urge my fellow compatriots not to fall victim to the evil-doing of those who wish to eradicate our roots and brainwash us and through that mould a new persona of us in their own image. The truth must and will prevail. I enclose Dr Farrokh's email below for my readers to view. The below article discusses how Iranians who have not relinquished their ancient Zoroastrian faith commemorate the tragic fall of their country first to an Arab occupation and later to a 1400 year long Islamic one which is ongoing and has forced Iranians to convert to Islam. However as the article rightfully mentions Iranians have never lost touch with their ancient pre-Islamic roots and still practice them with great love and care - celebrations marking this include Norooz, Chaharshanbe Soori, Yalda, Tirgan, Mehregan and many other Iranian celebrations. The majority of Iranians today are only "Muslim" by name but not so in deed and in the future I hope that even that shameful labeling of "Muslim" will be shed by those who have inherited it. Lastly I would like to point out a mistake in this article which is a reference to Zoroastrianism, the world's first monotheistic faith, as being a "sect" which is incorrect - some consider it a philosophy of life and others see it as a religion, however it is not a "sect". The below pictures are ones i've found which are taken from "Chak Chak" (Pir-e Sabz) which is the site described in the article. CHAK CHAK, Iran: Dressed in white to symbolize purity, a priest recited from the Zoroastrian holy book at a shrine as members of this ancient pre-Islamic religion marked what they see as one of the most bitter events in Iran's history: the 7th century Arab conquest of Persia. The Arab invasion changed history for Persia, the ancient name for non-Arab Iran: Islam was imposed as the new religion, replacing Zoroastrianism, whose followers were dispersed. Thousands of Zoroastrians — from Iran's small remaining community and from India, the United States and other countries — gathered at this mountain shrine this week for five days of ceremonies that ended Monday, commemorating the event. Priest Goshtasb Belivani addressed the gathering, standing at the tall bronze doors of the shrine, built into a cliff-side cave where a heroine of the faith, Nikbanou, is said to have fled from the Arab assault. 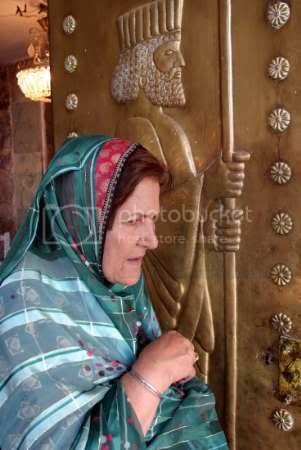 "We have all gathered at this sacred place to pray Ahura Mazda," he said, using the Zoroastrians' name for God. "We are also here to remember Nikbanou and what happened to our ancestors by the Arab invaders." Belivani spoke to the crowd in modern Farsi, before reciting the verses from the Avesta, the faith's holy book, in an ancient version of the language. According to legend, Nikbanou, the youngest daughter of the last king of the Persian empire, took shelter in the mountain and prayed to Ahura Mazda for help from the attackers. Miraculously, the mountain opened up and gave her protection. Near the shrine, a slowly dripping spring emerges from the mountain, giving the site its name — "Chak Chak" means "drip drip" in Persian. The legend says the spring is the mountain shedding tears in remembrance of Nikbanou. An immense tree stands nearby, said to have grown from Nikbanou's cane. 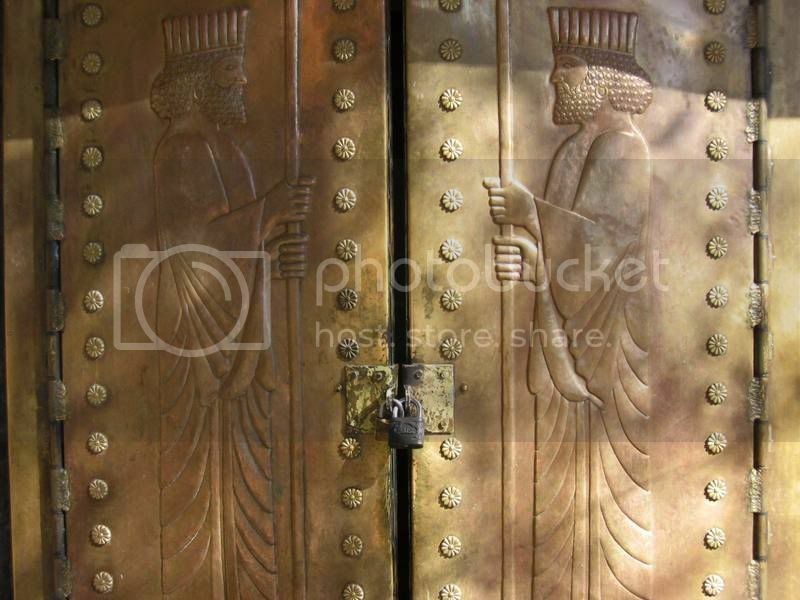 The legends regretting the invasion that brought Islam to this country highlight the unusual status of Zoroastrians in today's Iran — ruled by an Islamic government headed by clerics. 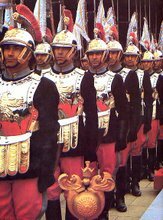 Since coming to power in the 1979 revolution, the Islamic Republic has tolerated the sect, giving it official status and guaranteeing a Zoroastrian seat in parliament. It also allows its members to practice their rites. For example, while the law forbids mixed dancing, Zoroastrian men and women are permitted to dance together and play music as part of their worship in special places like temples or covered buildings. Still, the Zoroastrian community's numbers have dwindled to around 50,000, down from 300,000 in the 1970s, with many emigrating to the U.S.
Human rights reports say Zoroastrians — like members of Iran's small Jewish and Christian minorities — suffer some discrimination, kept out of some jobs. 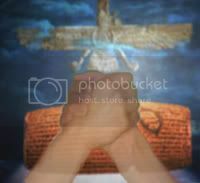 But many Zoroastrians left simply because of the general restrictions on all Iranian society imposed by the Islamic government. Still, Zoroastrian traditions remain embedded in Iran, where the population of 70 million — overwhelmingly Shiite Muslim — take deep pride in their pre-Islamic civilization. Every year, Iranians of all religions mark Chahar-Shanbe Suri, or the Wednesday feast, part of celebrations for the Persian New Year, in March. During the rites, Iranians light bonfires in the streets and jump over them and dance, hoping to put failures behind them — and the rite has persisted despite attempts by the ruling clerics to discourage it as un-Islamic. "Zoroastrians are not a big population in Iran but our rituals remain widely respected not only in Iran but other parts of the world," said chief Zoroastrian priest Ardeshir Khorshidian. At Chak Chak — also known by the name Pir-e Sabz, 550 kilometers southeast of the capital Tehran — the pilgrims crowded into pavilions set up at the base of the mountain, below the shrine in the cliff. Families sitting on rugs had picnics, while children danced and their parents attended prayers in the shrine. "For many Zoroastrians, summer begins with a pilgrimage to Pir-e-Sabz," said Pedram Soroushpour. "This event is a symbol of Zoroastrians remaining loyal to their manners and rituals." The ‘Solidarity Iran’s’ assembly concluded its last session in Paris on Sunday 17th June with the election of 21 member coordinating council. The assembly also adopted three documents; on the state of affairs in Iran, on the organizational structure and the identity of the body charged with carrying the work of ‘Solidarity Iran’ forward. The Assembly capped a process that started with the participation of activists from the left to the right, from republicans to monarchists and secular Muslims. The Assembly added the active participation of representatives of major Kurdish, Azeri, Baluchi, Turkmen and Bakhtiari organizations. Through participants work with the youth, women, workers and ethnic groups in Iran, 'Solidarity Iran' will now start work on connecting protest movements inside the country with those in the international community who care for the Iranian people against religious tyranny. 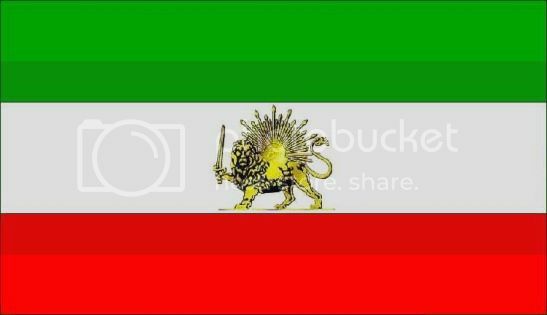 Down With the Islamic Republic Occupying Iran! 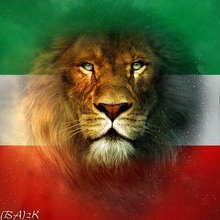 More power to the Iranian peoples' freedom movement! 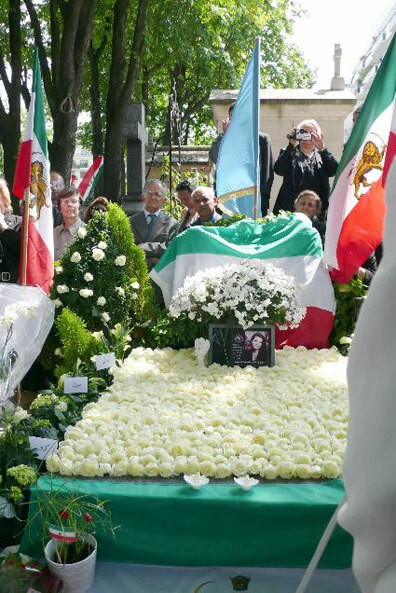 Empress Farah Pahlavi with friends and supporters of the Imperial Family gathered in Paris, at the Passy Cemetery, in memory of the late Princess Leila Pahlavi (March 27, 1970 - June 10, 2001) on the 6th anniversary of her demise. The tragedy lies in that the late Princess could not bear living with the betrayal (by her own countrymen and those who called themselves "allies") and the sudden loss of her father; also the fact that Iran was reduced to the miserable state that it is today (Islamist Occupational Regime) also had a tremendous impact on her - in effect the Iranian peoples' treason to the King (her father) and Country (Iran) is what led her to take her life. Iranian students warn AhmadiNejad and the Islamist establishment that they cannot stop them! "Aghaye Ahmadinejad! Ma tormoze ghatare jonbeshe daneshjooyi ra kandeim! Iranian students have been holding protests against the illegal detentions of tens of their fellow students, apprehended by Islamist security forces on charges relating to "endangering national security"! The above placard reads: "Mr AhmadiNejad! We have torn off the brakes of the students movements' train!". This is in reply to the occupying Islamic Republic's statements that "the regime's nuclear technology progress is like a train whose brakes have been removed"! It's a very tense time in Iran with workers, students, academics... being arrested on charges of "endangering national security" and things will only get tenser from here on. Next month is the anniversary of the savage and unprecedented attack on Tehran University students (July 9, 1999) who were attacked in their sleep by club/knife wielding Islamists of the state apparatus, leading to several deaths! This event sparked the largest anti-regime demonstrations ever experienced in the 28 year long Islamist occupation and has been marked each year with demonstrations by student-activists. More power to the Iranian freedom movement.